Healthy food pyramid presents healthy choice of food for your everyday menu.The pyramid contains variety of food in certain doses necessary to meet the daily needs of your organism. 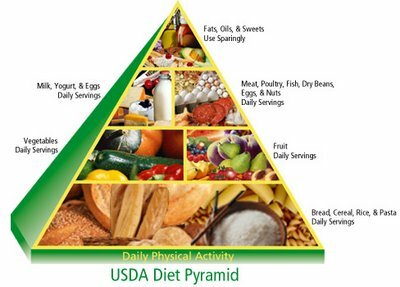 The pyramid is a reliable guide to plan your healthy diet. In the base of the pyramid you can see weight control and daily body workout because these two elements have strong influence on your health. Healthy food pyramid shows that you should eat more food from the bottom of the pyramid (vegetables, whole grains) and less from the top (sweet drinks, red meat, salt). The base of the pyramid, which also shows the largest amount of food necessary to be consumed during the day is different for all population groups. The base of the food pyramid for the older people is filled with water. Due to loss of skin elasticity and constant danger of dehydration, people older than 65 years should drink water with every meal. Food pyramid for kids is different because of the higher amount of fruit and vegetables, vital source of vitamins and minerals for proper growth and development. Children need to import a large quantity of calcium (1300 mg per day, compared to 1000 mg daily required dose for adults) for proper development of bones. Latest pyramid for adults includes physical activity. Adults should be physically active at least 30 minutes every day. Recommended daily intake of calories is 2000 kcal. The body uses carbohydrates mostly as source for daily energy. Half of the grains consumed during the day should be integral. Whole grains are best source of carbohydrates. You should avoid white flour. Whole grains include oats and rice. Our body needs to import about 180 gr whole grains per day. A diet rich in vegetables has bountiful benefits. Vegetables helps in reducing the risk of heart attack or stroke, protect against some cancers, lower blood pressure etc. You should eat about 200-300 grams versatile vegetables every day. A nutrition rich in fruit has bountiful benefits as well. You should consume fruits every day, especially citrus.You should avoid juices with artificial flavors. Oils are essential part of the diet because they improve the taste of food and provide necessary nutrients including vitamins D, E, K, and A. Mostly used nutritional oils are vegetable oils and fish oil. You should consume less hard fats like butter, margarine and pork fat. You should consume milk and dairy products bring the required amount of calcium in the body. Experts recommend 3 cups of milk per day. You should consume 170 grams of meat and meat products every day.It is recommended to eat fish because it is rich in omega 3.It is advisable to eat one boiled egg per day because eggs are rich in iron. To maintain its nutritional values, you should prepare food properly. Experts recommend boiling or steam-cooking, rather than frying.